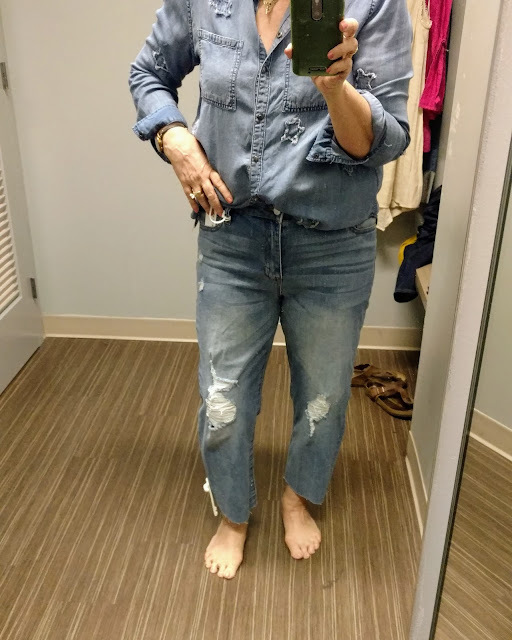 Spoiler Alert: I did not buy one thing in these try on sessions! 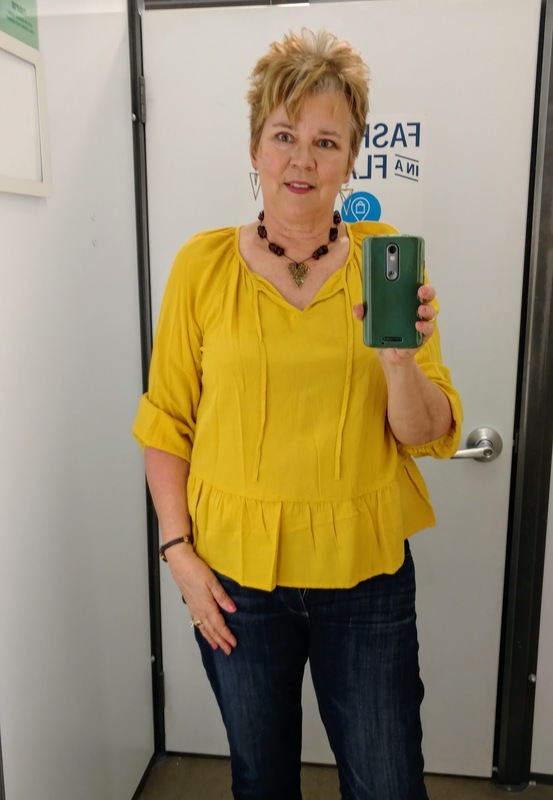 When the change of seasons rolls around, many of us take a critical look inside our closets and drawers to see what might need refreshing or updating. On that note, I couldn't be more happy to do that as many of my things seem stale. 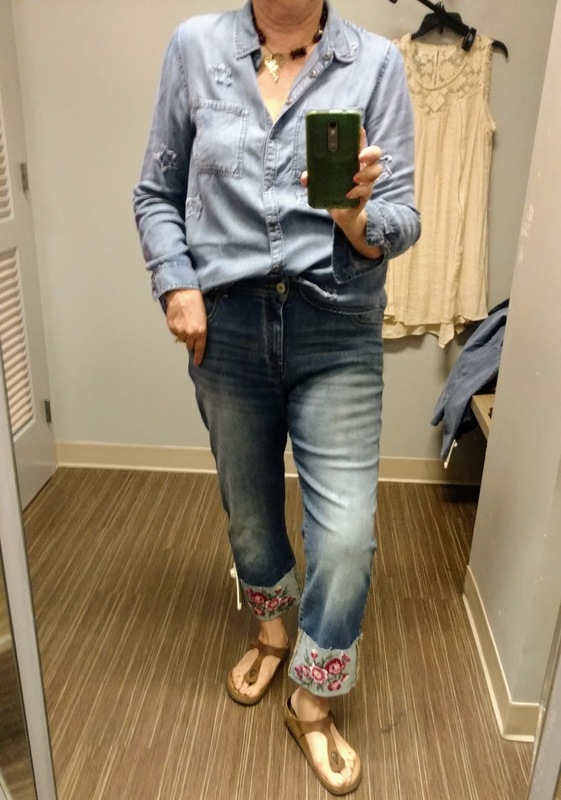 The above I.N.C jeans fit me really well and had the added bonus of the embroidery on the cuffs. They are still a kinda, sorta question mark. (They were priced at $99--if they came down in price, say the $60-range, I would probably more seriously consider them.) I sized up since they are high waisted. 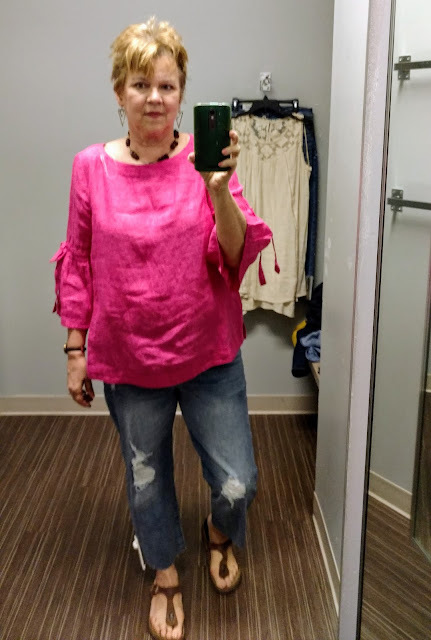 I'm still fighting high waists, it feels like soooo much fabric. And, while embroidery is one of the details I enjoy finding, I wasn't loving this particular pattern. 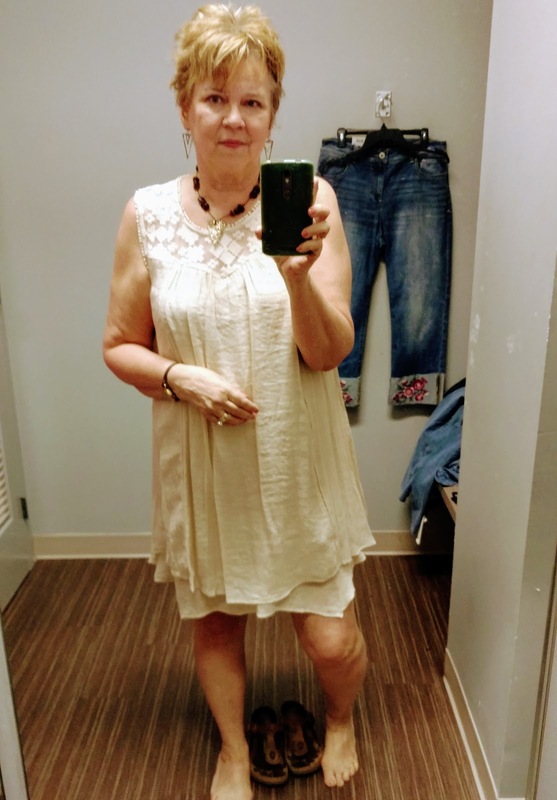 I thought this dress (similar) might be a good layering piece. Alas, it was polyester and I was immediately too hot in it. Charter Club linen top with bell tie sleeves. Great color and fabric, it added width right across my mid-section. Um, no. Last up, Celebrity Pink jeans (similar). These were on clearance for $12-$13. They fit fine, there is more distressing than I prefer, which I could have gotten past at that price point, and I didn't love the cut of the legs. Boho Tie-Neck Swing top. The cut looks skimpy on me. On the plus side, it is rayon. This is a four-in-one photo. 1) The Relaxed Tie-Front Mariner top was a lot cuter on than it was on the hanger. If I didn't have a soft, wide middle, I would have purchased this. Although, maybe I should try it on with a different waistband. 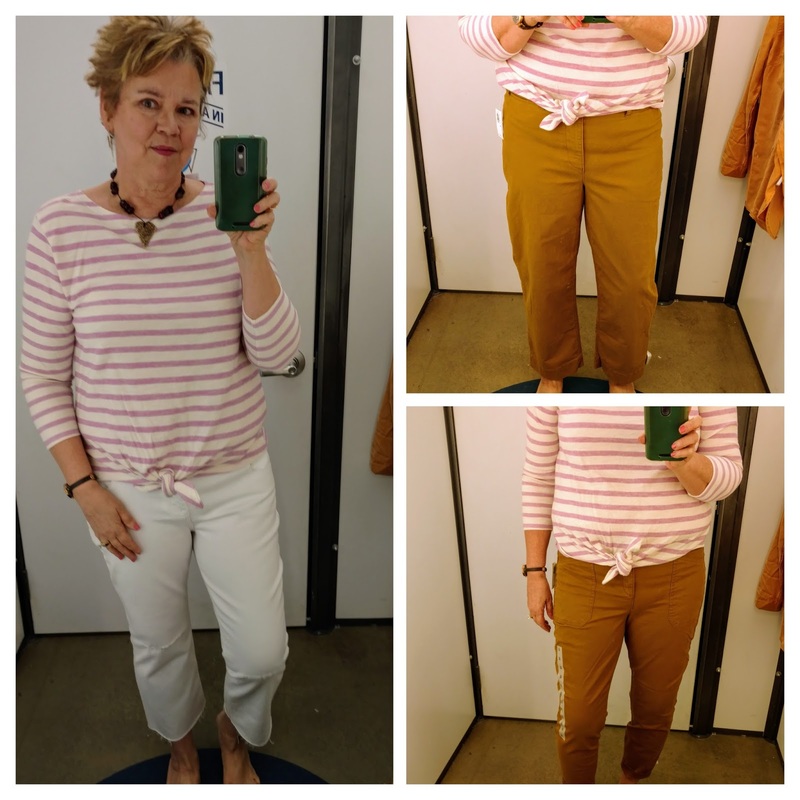 2) Cropped White Flare Ankle jeans were a little more snug than I would like. 4) Mid-Rise Pixie Utility Chinos, too tight. I didn't try sizing up. Lastly, the Relaxed Tencel Shirt, fabric is a plus. 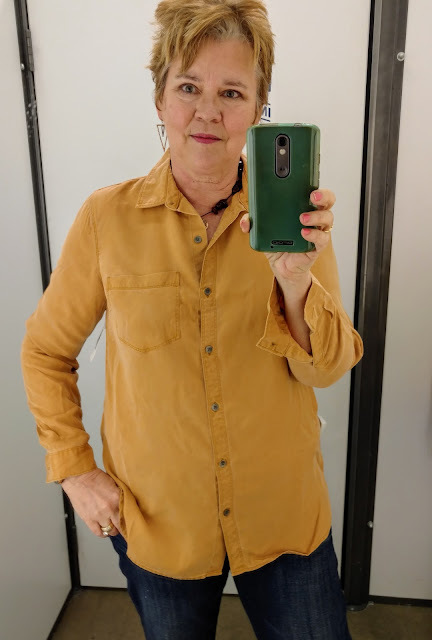 Apparently, Old Navy cuts its clothing with a less mature, or more slender figure than mine as it didn't seem quite as roomy as I'd want for shirt of this style to be. Otherwise, it would have come home with me. I always say it's feast or famine. Not only with what you like but with how it fits. Although a pair of jeans for $10 is a deal. Heck you could cut them off and make them shorts! !